Whether you have a nonprofit, a socially responsible business, or a cause you work passionately on, Miami’s lack of inspiring workspaces has impacted our ability to connect with like-minded changemakers and serve the community. But what if there were a place where everyone who wanted to make a difference in Miami could work, collaborate, and learn from each other? What if there was a coworking space with a conscience? — A shared office that offered more than just WiFi and free coffee? 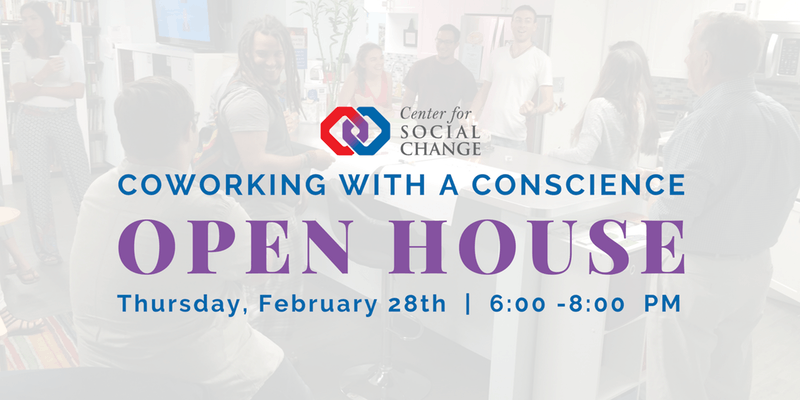 Join us on Thursday, February 28th at the Center for Social Change for our Coworking with a Conscience Open House event, where you’ll get to meet and mingle with Miami’s nonprofit leaders, and social entrepreneurs. Enjoy light refreshments, take a tour of our coworking space, and get your first month of coworking for FREE when you sign up before or during the event. The parking details below are specific to this event. If you’re traveling by car: You may park at Our Lady of Lebanon Church, located at 2055 Coral Way. Please note that this is grass only parking. Floor 2A of the parking garage attached to 2103 Coral Way, is the accessible floor and has disabled permit parking. Electric vehicle recharging stations are also available. The parking garage has its own Pay-by-Phone system for all parking spots. There is also metered parking adjacent to the building payable with Pay-by-Phone and there is some free street parking in the surrounding neighborhood, especially south of Coral Way. Be sure to observe “Residents Only” and “No Parking” areas. If you’re traveling via mass transit: Miami-Dade Bus #24 and the free City of Miami Coral Way Trolley both stop just around the corner from the building. Both bus lines connect to the Vizcaya Metrorail Station at Coral Way and SW 12th Ave. If you’re traveling by bike: Bicycle racks can be found along the sidewalk in front of the building and in the garage. Will C4SC record the event?